Burlington County residents in the area of Joint Base McGuire-Dix-Lakehurst were evacuated from their homes Wednesday afternoon after a 40-acre forest fire broke out and caused several traffic detours. 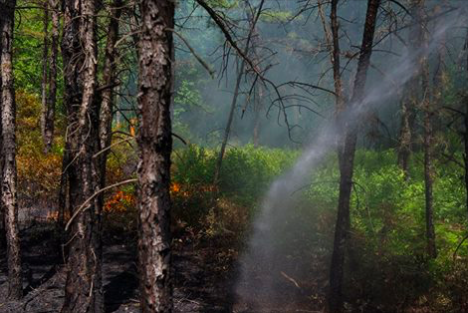 Related Article: Rolling Stone: New Jersey pinelands primed for worst wildfire in U.S. In a statement on Facebook, Joint Base McGuire-Dix-Lakehurst warned residents and commuters of the blaze, which broke out at around 2:30 p.m. The majority of those evacuated reside in the Browns Mills section of Pemberton Township. They were asked to remain away from their homes until crews contained the brush fire. "Tri-base officials are aggressively working with the Burlington Fire Department and the New Jersey Forest Fire Service to contain the fire," Senior Airman Lauren Pitts told NJ.com. The cause of the fire remains unknown, but Pitts said training exercises have occasionally resulted in fires as windy conditions can feed on bullet casings. Another 2,000-acre blaze was contained last week at the same base, leaving plumes of smoke visible for miles. Earlier this month, a fire in the pinelands shut down Route 72 for several hours.